“Markets Drift Lower”? My gosh man, didn’t you see the massive one day drops? Yes, I did, but I also noticed the massive one day rallies. From the chart below we can see the volatility in this market from day to day, but also intraday due to the wide spread of the bars (difference between the high & low price of the day). This flattening out at the recent top shows the indecision between the bulls & bears, and it continues on. The recent trend is for prices going lower but note that there is little “panic” to sell. Volumes remain about average (the red line on the volume bars) and the Money Flow chart above shows a steady lower reading. No panic, just steady selling. Fridays rally was nice but it was on lower volume, not much commitment there. The Sentiment indicator remains “Bearish” as well. We got our Close below 4545 and also 4500, a confirmation of a weak market. I’m not going to feel very positive until we get a Close above 4545. 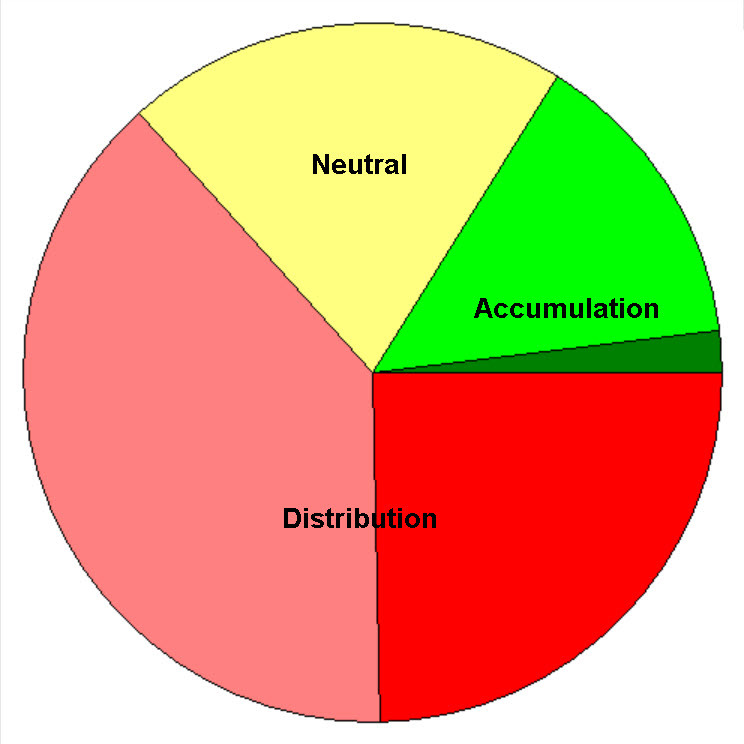 The pie chart below shows the number of stocks in the S&P 1500 that are currently in Accumulation (green), Neutral (yellow) and Distribution (red). The table below shows the top sectors, but notice the “A/D Letter” ranking at the far right. Only one is strong enough to be green. The majority of indicators point to lower prices, that appears to be the trend. Perhaps the markets are concerned about a terrorist attack or some other geo-political flare up. Indecision with a bed toward the Bear. Be careful out there. Have a good week. ……. Tom ……..